We are saddened to announce the untimely demise of our beloved Ex-Principal of The Fabindia School, the much loved and honoured Ms. Parinita Ranpal. She will always live in the hearts of the people of Bali and will be remembered for her contribution in building the School. 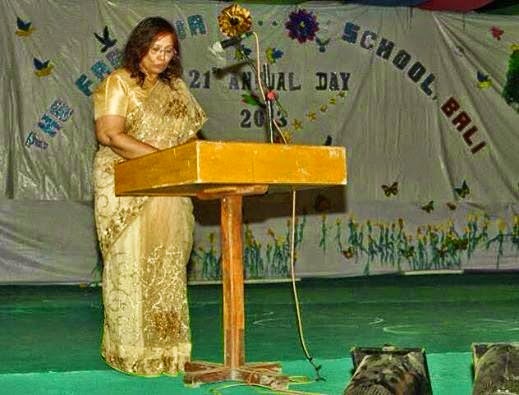 "Lost the legendary Ex-Principal of The #FabindiaSchool, Bali Mrs. Parinita Ranpal, she was suffering from lung disease and was in ICU for her last 2 days. Your efforts for the development of the school would be remembered always, you took the school to a big leap ahead !! #RIP ma'am, #Respect from the bottom of heart !!" Nimendra Raj Singh Bali we do respect you for sharing this information and the School has decided to institute the Parineeta Ranpal English Prize at School in her honour, we value her great efforts and cherish the memory of her good work. In honour of Mrs Parineeta Ranpal our Ex-Principal, the Board and the School Management have instituted the Parineeta Ranpal English Prize, for the best performing student in English in Class 12 at The Fabindia School. The Prize will go the the Student who has the highest aggregate score in English in the year, by adding up all the tests and exams. The first edition of the Prize will be announced on the 21st of Nov 2014, at the Annual Day. It is really sad to hear about your demise. You will always remain in the memories of the students and teachers. I pay my tribute to you.